Plant the seed that includes seven flavors that deer love with the 7 Card Stud Food Plot Seed. This 10 pound bag plants up to 1/4 acre with a delicious mix that includes Triticale, Forage Oats, Winter Peas, Crimson Clover, Chicory, Turnip, and Daikon Radish. Attract deer to your food plot all season round with growth from early to late in the year. 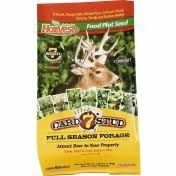 The Evolved Harvest® 7 Card Stud Food Plot Seed grows healthy deer in an easy to plant seed.